Ground covers paint a landscape in an array of colors. Gardeners love them for both the decorative and functional value. With such a wide variety of colors and textures to choose from, the hardest part is choosing which varieties to grow. The majority of species thrive in shade, so they�re a perfect fit for those dark areas under low, thick trees. If you�re trying to figure out how to choose ground cover for shady yards, consider both the growing conditions of your landscape � drainage and soil type � as well as the aesthetics. Choose varieties that�ll add visual interest and texture with ornamental berries, interesting foliage and small flowers. Covering your yard in a sea of flowers creates an atmosphere of fantasy. Choose varieties with different bloom times and stagger where you plant them. Pay attention to the height of these plants so you don�t inadvertently conceal the smaller flowers behind larger ones. Come spring your landscape will be ever-changing with new blooms. Geraniums are low maintenance and hardy enough to grow in most environments. The lovely magenta flowers and fragrant foliage make yards come alive in summer. Periwinkle adds whimsy to hilly landscapes. Use it as a gentle border between a neighbor�s property or a beautiful compliment to towering, full trees. They produce pretty lilac and delicate blue flowers. Leadwort�s deep green leaves turn scarlet in fall that accentuate its vivid blue flowers in spring and summer. Hertfordshire Rose adds picture-perfect clusters of saucer-shaped pink blossoms and glossy green foliage. It flowers all summer and stands up to rain. Astilbe Visions is a perennial variety that tolerates damp, shaded ground. It produces green foliage and deep purple plumes. Gardeners love that it attracts butterflies and resists deer. Hostas are among the most popular varieties as they thrive in shade and soil with good drainage. The thick green and white foliage works well as garden and tree borders. Plus, mature plants are easy to split so you can double your coverage each year. Willow produces full green leaves and small flowers. The dense growth stays low to the ground and works well for slopes, awkward spaces and other hard-to-mow areas. Ground covers that produce ornamental berries bring much-needed color and texture to sparse landscapes, and attract birds all year. Wintergeeen produces lovely berries in winter and has scalloped foliage that offers nice contrast to trees and hedges. Creeping wintergreen grows 6 to 12 inches high. It has eye-catching pink and white flowers in summer and dark red berries in winter. Lingonberries creep over the ground and add striking fall color as leaves begin to turn. 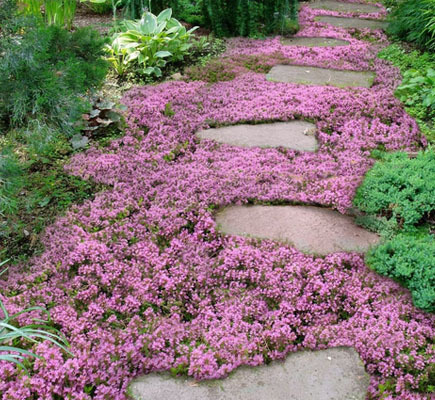 They�re a beautiful contrast to mixed beds, rock gardens, and walkways. Formosa carpet ground cover raspberry is one of the more unique, fast spreading evergreen varieties. Best of all, you can eat its amber-colored fruits. This low-maintenance plant is perfect for gardeners big on vision but short on time. When deciding on ground cover for shady yards, remember to consider whether you want a spreading or non-spreading variety. Spreaders do a lot of the work for you if you want a large area covered quickly. Non-spreaders are a great fit for tight spaces and to define plant beds. No matter what varieties you plant, you�ll discover beautiful pockets of life as they begin to flower, spread and turn surprising colors.